GBA Castlevania: Aria of Sorrow (USA) "Julius mode" in 04:38.9 by cpadolf. 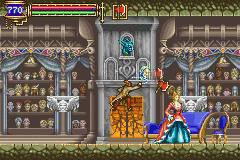 Those who greatly dislike that Aria of Sorrow's main character isn't related to the Belmont clan whatsoever can safely relax, because the powerhouse known as Julius Belmont enters the stage in the relatively short run of this Castlevania installment. Julius is only available to those who have completed the main quest, but unlike Soma Cruz, Belmont can't go through walls or use other fancy tricks like that. Being very upset about it, he hops around the castle madly, producing almost inhuman sounds with every jump. This is an improvement of almost 13 seconds, mostly due to better boss fights. Note: this movie starts where a main quest TAS left off. We do not usually accept movies beginning from a save. Please read our rules to see our reasons.